At Royal Restoration, Inc. it is our goal to consistently provide quality products and superior service in a professional manner. We are committed to building lasting relationships with our customers by ensuring 100% customer satisfaction. A beautiful entry creates a dramatic first impression and a welcome focal point for your home. Make the first impression a distinctive one with an entry door system from Royal Restoration, Inc.
We offer fiberglass, steel, steel exterior/ wood interior and solid wood doors from a variety of manufacturers. 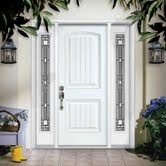 Our door systems by Masonite are built with lasting performance using premium components and workmanship. Oakcraft and Artek Fiberglass Doors by Masonite are a beautiful alternative to more expensive solid wood doors. The wood grain on an Oakcraft door is deeper than similar products, so whether you paint or stain, the door will retain its natural wood appearance. Excel Steel Doors by Masonite are a more cost effective option that are high quality and offer many luxurious options of styles and glass inserts. Your Royal Restoration, Inc. door will make for a memorable entrance that will provide curb appeal, and will help make your home the envy of the neighborhood! If you're looking for an experienced, knowledgeable and professional window and door contractor, please give us a call today 763-788-0092 or CONTACT US to request a FREE door estimate.